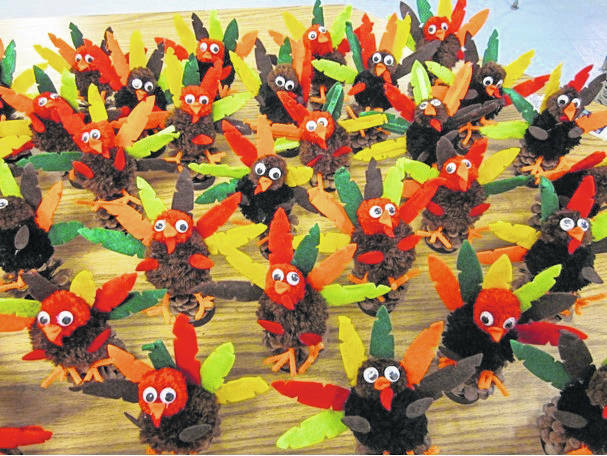 The 60 turkeys made by Rosie Miller’s students were given out to Pleasant Valley Nursing and Rehabilitation residents. Student Jason Adams presenting Pleasant Valley Nursing and Rehabilitation resident Leona Burrows with her turkey. POINT PLEASANT — A local teacher is having her students participate in not only a holiday art project for class, but also in the season of giving. Rosie Miller, a teacher for the Mason County School for Success, shared her students’ current project is making special holiday themed handcrafted gifts for all of the residents/patients at the Pleasant Valley Hospital Nursing and Rehabilitation facility. Miller has three students for her art class and she was contemplating on a good project for her students to complete this semester. With it being the start of the holiday season, she decided having her students make holiday themed handcrafted gifts for the approximately 100 residents/patients at PVH would be just right. “We have completed about 60 turkeys for Thanksgiving and will also be making Christmas decorations so that all residents/patients will receive a handcrafted gift,” said Miller. It took her students about 25-30 minutes to make each turkey, a few of the turkeys were made in an assembly line fashion with all of her students working together, the others were made individually. Miller is still in the planning stages of what her students will be making for their Christmas gifts, which will be handed out within the next few weeks. One student, Jason Adams, was able to go with her to PVH to hand out the turkeys to the residents, which she said Adams really enjoyed. 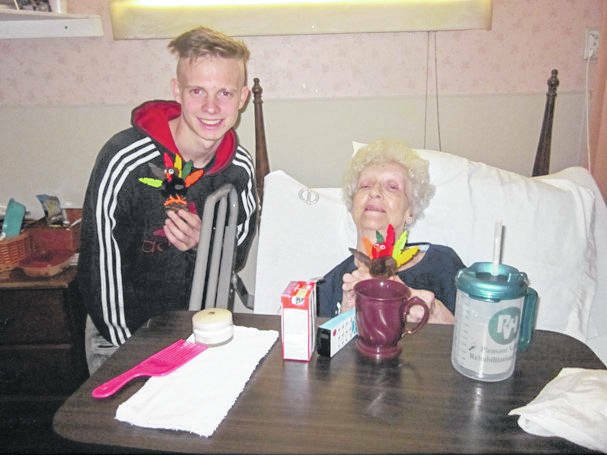 The residents were pleased with their handcrafted turkeys, Miller saw many smiles that day and felt all of the residents who received a turkey appreciated the gesture. Miller explained the School for Success is designed for students with a variety of special needs who need a teaching style different than in an average classroom. The students are given more of a one-on-one style teaching that helps them perform better as students.